Stetson University presents the one-act musical comedy “[title of show],” directed by Julie Schmitt, Ph.D., director of the Theatre Arts program. The production takes place from Feb. 14-24 at Stetson’s Second Stage Theatre, located at the Museum of Art – DeLand. The musical focuses on Jeff and Hunter, two guys who are trying to write a musical about two guys writing a musical. With music by Stetson alumnus Jeff Bowen and book by Hunter Bell, this Tony Award-nominated and Obie Award-winning musical is sure to please audiences from beginning to end. Musical writer Jeff is inspired to call their new original musical [title of show] while fellow cast members Susan, Heidi and Hunter express their doubts. The play will be performed by Stetson’s Second Stage Theatre, Feb. 14 – 24. From left to right: Danny Mejia, Caroline Barkowitz, Shanellie Figueroa and Joseph Dallas. Photos by Ken McCoy. Jeff and Hunter, two self-confessed nobodies in New York, make a pact: They will write an original musical and submit it to a festival. The only catch? The deadline is in three weeks. No worries, though. They’ll just write a musical about writing a musical. Early on in the process, they realize that they’ll need the help of their good friends Heidi and Susan to create a truly successful original musical. Frequently hilarious, occasionally heartbreaking and thoroughly inspiring, “[title of show]” is a love story celebrating individuality and creativity. “Working on this musical has been a fantastic experience so far,” expressed Schmitt. “The actors are really finding their voice both musically and creatively and are making real connections with these characters and it is a joy to watch. Experience the comedic escapades of these four friends as they embark on a creative journey to present an unforgettable musical. Warning: The musical contains mature subject matter and language, and may not be suitable for all ages. 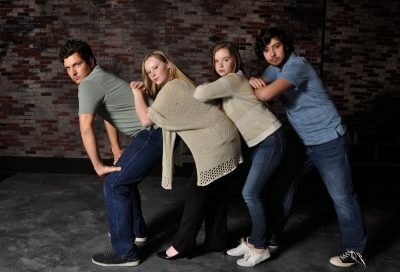 After creating an original musical called [title of show], cast members pose for an awkward photo shoot. From left to right, with Stetson’s Second Stage Theatre, are Danny Mejia, Liza Tananbaum, Caitlyn Carey and Joseph Dallas. Cast: Danny Mejia (Jeff), Joseph Dallas (Hunter), Shanellie Figueroa and Caitlyn Carey (Heidi) and Caroline “Reed” Barkowitz and Liza Tananbaum (Susan). The roles of Heidi and Susan have been double-cast, meaning Caitlyn Carey and Liza Tananbaum will be performing on Feb. 14, 16, 22 and 24, and Shanellie Figueroa and Caroline “Reed” Barkowitz will be performing on Feb. 15, 17, 21 and 23. Tickets will be available at the door and reserved tickets must be picked up 30 minutes prior to the start of the performance. The box office will be open one hour prior to curtain.